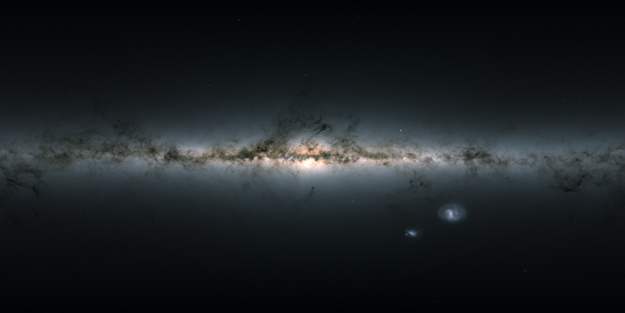 Gaia's all-sky view of our Milky Way Galaxy and neighbouring galaxies, based on measurements of nearly 1.7 billion stars and displayed in an equirectangular projection. It has been obtained by projecting the celestial sphere onto a rectangle and is suitable for full-dome presentations. The map shows the total brightness and colour of stars observed by the ESA satellite in each portion of the sky between July 2014 and May 2016. The two bright objects in the lower right of the image are the Large and Small Magellanic Clouds, two dwarf galaxies orbiting the Milky Way. Other nearby galaxies are also visible, most notably the Milky Way's largest galactic neighbour the Andromeda galaxy (also known as M31), seen in the lower left of the image along with its satellite, the Triangulum galaxy (M33). A version of this image tagged with meta data to view as a 360° image is available to download here [8192×4096 pixels, 10 MB]. A 360° video of this image is available here.